When you see those two blue lines on the pregnancy test, your life changes immediately. Your body is no longer just for you, it is about to embark upon an amazing adventure. And during that adventure you are the vessel, perfectly designed to sail the seas towards motherhood. It’s so important to look after yourself during this time, and there are many ways that you can do that- and you don’t need to compromise on life’s luxuries either. After all, we all need some pampering now and then. And when your body isn’t your own, the desire to make yourself feel better with a touch of makeup or a spritz of perfume is more than tempting. But how to avoid unnecessary chemicals or additives? 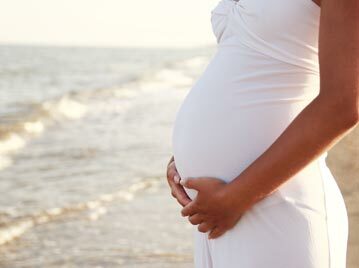 Here are some tips for a naturally beautiful pregnancy. Lots of hair products on the market contain chemicals and additives that are no good for you, especially during pregnancy. Why not make your own hair mask with coconut oil and honey? Bicarbonate of soda is great for a deep cleanse and believe it or not apple cider vinegar is fantastic for conditioning dry hair too. There is no need to spend a fortune on natural hair care, and you might find that the surge in hormones during pregnancy will send your hair into a state of glorious shine anyway. Simply place all the ingredients in a food processor and mix until smooth. Apply to the hair and leave for 30 mins before rinsing with warm water. Your hair will thank you for it! Don’t forget your sunscreen this summer! Hormonal changes in the body during pregnancy means that sunscreen is so so important, but you don’t want to smother your skin with chemicals. During pregnancy your skin is more sensitive and makes you more susceptible to hyperpigmentation so what you use to protect your skin couldn’t be more essential. Make sure your sunscreen is 100% natural and rated SPF 30 or higher. Your pregnancy is going to stretch your skin, and skin that is not sufficiently hydrated is going to suffer. Keep stretch marks at bay by moisturising at least twice a day- but make sure the cream you use is kind to the skin. Coconut oil is perfect for hydrating dry skin, but you could go for any organic butter or plant based oil. This is probably the most important tip of all! Your mind and body (and baby) will thank you for drinking lots of water and not only will this help keep your energy levels up, but it will keep your skin hydrated too. If you do colour your hair, try to use natural dyes wherever you can, but during pregnancy you might want to skip it altogether. Conventional hair dyes tend to contain a lot of chemicals, so it’s probably best to embrace your natural colour for a while! When you’re pregnant, your body is busy. Your mind is busy. YOU are busy. It’s important to take some time for yourself and make relaxation a priority every day. Whether it is by meditation, sleeping, yoga or swimming- what you do to relax is up to you. The most important thing to remember is that you have earned it! Take some time out of your day to focus on your breathing, to settle your spirit and to remind yourself of the huge journey you are taking on. The road to motherhood can be long and windy, but you can take steps to make it as smooth as possible.